No this isn't one of the players sons practicing with the team, he is a prospect. 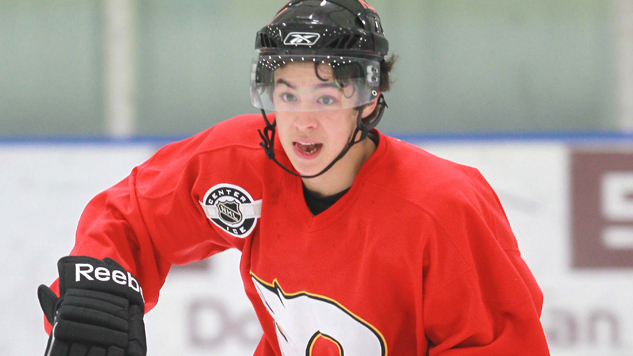 Have you heard of John Gaudreau? Not many casual hockey fans have, but the Calgary Flames are pretty excited about their 4th round pick (104th overall) in 2011. Gaudreau had first round round talent, but slipped in the draft because of his size. At the draft he was listed as 5'6" and 140 pounds. No that's not a typo, he really was 140 pounds. 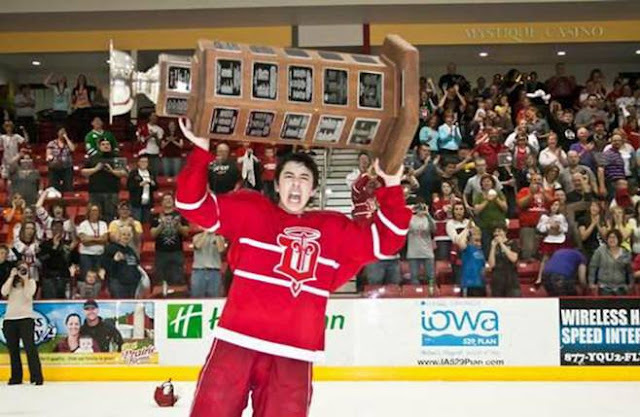 After his stint with the Fighting Saints, Gaudreau ended up with the Boston College Eagles in the NCAA Division 1 Hockey East conference where he would shine as a freshman in 2011-12. Scoring 21 goals and 44 points in 44 games, Gaudreau would lead all freshmen in scoring and finished just one point behind New York Rangers prospect, Chris Kreider, for the team lead. Kreider went on to join the Rangers for their playoff run and didn't look out of place in the NHL playoffs just to give you an idea of what type of season Gaudreau put up as a rookie. Gaudreau has the hockey IQ and blazing speed to get in and out of the heavy traffic areas without getting levelled and has been compared to another small-skilled player, Martin St. Louis. Gaudreau will have to add some muscle and bulk up if he wants to make it all the way to the NHL (now he's 5'8" and 153lbs! ), but so far he has scored and put up points at every level he has played so this might not be a problem if he's going to be Marty St. Louis 2.0. The 2012-13 NCAA Division 1 hockey season is just starting up and John Gaudreau will be one of the players I will be stat watching for as Boston College looks to repeat their great 2011-12 season. Gaudreau might not be a lock on a talented USA team at the 2013 World Juniors, but we hope he makes it as he would bring back memories of Nathan Gerbe at the tournament. Reminds me of Andy Miele, But a better scorer.